Photomicrograph of human breast cancer cells cultured in vitro on top of a CMOS chip. An array of capacitance sensors on the chip are used to track the health and growth of the cells. Researchers in the University of Maryland's A. James Clark School of Engineering are collaborating across engineering disciplines to create new "cell-based sensors-on-a-chip" technology. Pamela Abshire, electrical and computer engineering (ECE) and Institute for Systems Research (ISR); Benjamin Shapiro, aerospace engineering and ISR; and Elisabeth Smela, mechanical engineering and ECE; are working on new sensors that take advantage of the sensory capabilities of biological cells. These tiny sensors, only a few millimeters in size, could speed up and improve the detection of everything from explosive materials to biological pathogens to spoiled food or impure water. Today's biochemical detectors are slow and produce an unacceptable number of false readings. They are easily fooled because they often cannot distinguish subtle differences between deadly pathogens and harmless substances, and cannot fully monitor or interpret the different ways these substances interact with biological systems. To solve this problem, the Clark School researchers are learning how to incorporate real cells into tiny micro-systems to detect chemical and biological pathogens. 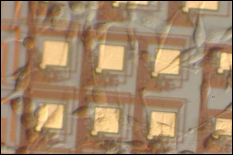 Different cells can be grown on these microchips, depending on the task at hand. Like a bloodhound hot on the trail of a scent, a chip containing a collection of olfactory cells plus sensing circuits that can interpret their behavior could detect the presence of explosives. The researchers plan to use other specialized cells much like a canary in a coal mine. The cells would show stress or die when exposed to certain pathogens, and the sensing circuits monitoring them would trigger a warning—more quickly and accurately than in present systems. The researchers are tackling the many challenges that must be met for such chips to become a reality. Abshire, for example, is building circuits that can interact with the cells and transmit alerts about their condition. Shapiro and Smela are working on micro-fluidics technology to get the cells where they need to be on the chip, and to keep them alive and healthy once they're in position. Smela is also developing packages that incorporate the kind of wet, life-sustaining environments the biological components need, while keeping the sensitive electronic parts of the sensor dry. Current research funding for the cell-based sensor technology comes from the National Science Foundation, the Department of Homeland Security and the Defense Intelligence Agency. Potential applications for their use extend well beyond national security, however. For example, cell-based sensors could detect the presence of harmful bacteria in ground beef or spinach, or detect the local origin of specialty foods like cheeses or wines. In the pharmaceutical industry they could identify the most promising medicines in advance of animal and human trials, increasing cost-effectiveness and speed in developing new drugs. And they could speed up research in basic science. Imagine tiny biology labs, each one on a chip, in an array of thousands of chips that could fit in the palm of your hand. Such arrays could advance biologists' fundamental understanding about the sense of smell or help doctors better see how the immune system works. They could be placed on fish as they swim in the ocean to monitor water quality, or set on a skyscraper's roof to evaluate air pollution. "We bring the capability to monitor many different cells in parallel on these chips," explains Abshire. "You could say we’re applying Moore’s Law of exponentially increasing computer processing capability to cell biology." The research won the University of Maryland's 2004 Invention of the Year Award in the physical science category. A patent application is on file with the U.S. Patent and Trademark Office. "We bring the capability to monitor many different cells in parallel on these chips. You could say we’re applying Moore’s Law of exponentially increasing computer processing capability to cell biology."